Our loyal readers will not have been surprised by the result of Theresa May’s early election. 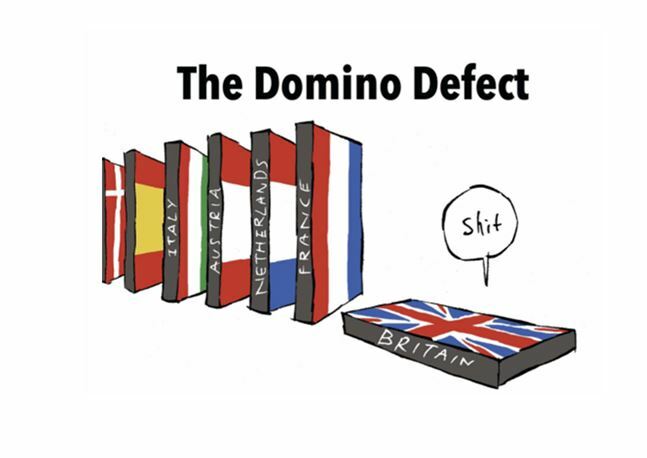 Not only had we put in perspective a defeat of Theresa May, despite the favourable outcome given to her by the polls; but, from Greece to the United Kingdom, we keep repeating that there is no exit from Europe, only some redefinition shocks… for better or for worse. If the Greek crisis proved the need to change Europe, the Brexit opened the possibility for it. For a year or so it was difficult to know what salad dressing we were going to get: would it be the British mint sauce (taking us to a new alliance of nations) or the mustard sauce of the mainland (upholding the Unionist principles, but regaining control of the institutions in one way or another). It is not the second British vote that represents the game-changer, but (as mentioned last month) the triple Austrian-Dutch-French vote marking the loyalty of the continentals to the principles of community destiny… It is true that the continentals, unlike the islanders, know atavistically that European wars always take place “at home”. The early election of Theresa May serves these purposes, we will see how – even if the UK now has to face the greed of the financial circles, who are dreaming of a hard-Brexit to recover most of the City’s European activities.
. and, hopefully, by the bottom, namely by following guidelines democratically validated by European citizens. On June 8, the British elected a new Parliament where a Common’s majority escaped from Prime Minister Theresa May and her Conservative Party. In order to form a government with an absolute majority, it would need 10 more votes, which she must seek in a hazardous coalition with the Unionist Party of Northern Ireland (DUP). The DUP programme is far from unanimous within the Tory party: ultra-conservative, anti-abortion, homophobic, against any Irish referendum, …which defends at the same time an ultra-liberal line. It is also opposed to the establishment of any customs control between the two Irelands, which is incompatible with a hard-Brexit as supported by Theresa May, which on the contrary implies such facilities. Hazardous also because, in the new configuration of the British Parliament, the Conservatories are the only ones defending a hard-Brexit. All the other parties are in favour of the “soft” Brexit. We can only point out that those results call into question the very process of Brexit, if not the Brexit itself. Quite simply because the collapse of Theresa May in the polls during the short election campaign is of course much less the so-called “blunders” committed by the Prime Minister than that of an acceptance by the British people of this election as a second referendum. But how did Theresa May get there? Last April, convinced on the basis of very favourable opinion polls, Theresa May had embarked on the reconquest of “Westminster” in order to control all the political forces of the country within the Brexit negotiations. This was reinforced very early in May by local elections, which crowned the Tory party, including ousting UKIP and sweeping away the claims of the Labour Party under the leftist leadership of Jeremy Corbyn; A bet which the British polls gave winner by granting her between 48% and 50% of intentions of vote. – to put a stop to the centripetal inclinations of regions like Scotland or Northern Ireland. On the latter point, if the centripetal forces in question do not date from the June 2016 referendum, they have nevertheless been greatly reinforced by Brexit. We should emphasize that Scotland, in particular, had largely rejected Brexit and considered resorting to a new referendum for its independence. Moreover, in January 2017, when the British Supreme Court had compelled the government to consult Parliament on the use of Article 50, in the same judgment it had denied the regional assemblies any “right of veto over the decision of the UK to leave the EU “(judgment of 24/01/2017), thus reinforcing the secessionist wishes. As for the last point, it is interesting to note that the elections result is valid despite this strategy, bringing a halt to the independence movements in Britain: particularly in Scotland. – a blow to the Scottish independence party, the big loser of this electoral consultation: it lost 21 seats! Alex Salmon the Scottish Independence champion is not even re-elected and Nicola Sturgeon is in a delicate position with regard to the leadership of the party. In view of the results, it is not even conceivable to move on to a new Scottish referendum project. – the situation is similar in Northern Ireland, where the independence party lost all its seats to Sinn Fein, but it is the DUP union which leads and should ally with the Tories to form the next government together with Theresa May‘s conservative party. – As for Wales, it is Labour that comes out largely as winners, which distances any secessionist policy whatsoever. 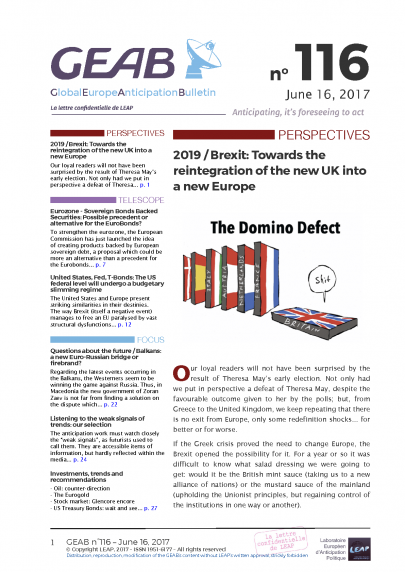 We discussed in a previous issue of the necessary reinvention of the principles of cooperation within the British Union with the aim of strengthening them, the same way it should imperatively happen on the European Union’s side. It seems that we are at the heart of this priority: after the elections of June 8th, we may wonder whether the English, Scottish, Northern Irish and Welsh regions still have a vocation – as well as an interest – to defend independence claims in the reconfiguration of the parliamentary and national forces. Instead, should their interest not be to play the card of the community of interests between them and with the central power, instead of opposing the latter, whose representatives are the only ones entitled to be at the negotiating table? In this way, they would associate themselves with the process, a lobbying policy very dear to the British, making sure that the way thus opened eventually leads to a bearable Brexit; especially since the other consequence of these elections is to challenge the line of negotiations for a “hard” Brexit as previously defended by Theresa May. The other positive result of this election for Theresa May is that it allows it to justify a change of negotiation line, moving from a hard-Brexit project to a soft-Brexit, henceforth adapted to the vital goal for the UK to avoid being marginalised in relation to a continent that has not followed their path. The great Brexit defender, the UKIP, is completely out, not even bouncing back with a single seat with its 1.8% of votes. This surprising result, just one year after its resounding referendum victory, underscores the pernicious role played by this party, which can be questioned whether it was not used to campaign for Brexit, something which part of the Tories, including Theresa May, had not dared to do. Once Brexit was acquired, this cumbersome “partner” was purely and simply sucked out by the extreme right wing of the Tories – a slide towards the extreme right which will have caused lost voices to their left wing, or to the profit of smaller parties, including the DUP in Northern Ireland. As seen earlier, all the political factions represented in the British Parliament defend a soft Brexit line: Labour (262 seats), SNP (35), LibDems (12), Sinn Fein (7 seats, which it will not occupy, in protest), the Greens (1), the left-wing party of Wales (4 seats) and even to a certain extent the DUP (10), although the DUP are anti-European they would not bear the consequences of a “hard” Brexit on the free movement between the two Irelands. Within the Conservative Party, the negotiations lines are also divided. If the party stood behind Theresa May in defending a hard line, a whole part of the centre-right of her party, who had campaigned for the Remain, including George Osborne (Theresa May is a “dead woman walking”), or her director of cabinet, Gavin Barwell (« concerns among Remain-supporters over the Tory approach to leaving the European Union »), call today to return to a soft-Brexit or even Theresa May’s resignation. On June 13 the Vice-President of the European Commission, Valdis Dombrovskis, unveiled the EC’s plan to discuss the euro clearing houses’ situation, which soon could relocate London’s business towards the EU. Source: Euractiv, 13/06/2017. Telling her the country is following her. Source: BBC, 18/04/2017. Note the participation rates of those different electoral dates: 72% for the June 2016 referendum; down to 36% for the locals of May 2017, and up again to 68,73% in June 2017. Sources: BBC, 24/06/2016 and Le Monde, 06/05/2017. It went from 54 to 35 seats out of 59 in the current parliament. Source: Wikipedia. Source: The Belfast Telegraph, 09/06/2017. ‘Hard Brexit is off the table’. Source: The Local, 09/06/2017. We have written it already, we suspect Theresa May being a hidden UKIP member – Read the previous bulletins. See Ruth Davidson, Tory elected in Scotland « Says Theresa May Should ‘Look Again’ At Brexit Plan After Election Defeat ». Source: Huffington Post, 10/06/2017. « The Scottish First Minister suggested a UK-wide consensus should be adopted for talks to allow the devolved governments a greater say on the terms of the country’s departure from the EU ». Source : Evening Standard, 12/06/2017. Eurozone – Sovereign Bonds Backed Securities: Possible precedent or alternative for the EuroBonds? Questions about the future / Balkans: a new Euro-Russian bridge or firebrand?